Indication L-Proline is extremely important for the proper functioning of joints and tendons and also helps maintain and strengthen heart muscles. Pharmacology L-Proline is a major amino acid found in cartilage and is important for maintaining youthful skin as well as repair of muscle, connective tissue and skin damage. It is also essential for the immune system, and for necessary balance of this formula. It is an essential component of collagen and is important for proper functioning of joints and tendons. L-Proline is extremely important for the proper functioning of joints and tendons. Helps maintain and strengthen heart muscles. • For use as a catalyst in an asymmetric aldol cyclization, see: Org. Synth. Coll., 7, 363 (1990). For reaction scheme, see 2-Methylcyclopentane-1,3-dione, A13936. For use in a direct enantioselective crossed aldol reaction with aldehydes, see: J. Am. Chem. Soc., 124, 6798 (2002). For use as an organoctalyst in direct aldol reactions of ɑ-oxyaldehydes, as the first step in a two-step synthesis of carbohydrates, see: Angew. Chem. Int. Ed., 43, 2152 (2004). Mediates the enantioselective borane reduction of ketones to chiral alcohols with moderate to good ee: Monatsh. Chem., 131, 91 (2000). 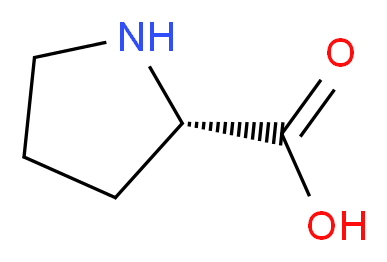 Also used to induce high ee in the ɑ-amination of aldehydes with Dibenzyl azodicarboxylate, L19347: J. Am. Chem. Soc., 124, 5656 (2002), or Diethyl azodicarboxylate, L19348: Angew. Chem. Int. Ed., 41, 1790 (2002). • For a review of the use of proline as a chiral catalyst, see: Synlett, 1675 (2001); Synlett, 1973 (2006). • For preparation from L-proline of the chiral hydrazone "SAMP", and enantioselective syntheses using the RAMP/ SAMP methodology, see: Org. Synth. Coll., 8, 26, 403 (1985). • For formation of a fused pyrrolidino-oxazolidinone, and use of the product in a synthesis of enantiopure ɑ-branched amino acids, see: Org. Synth. Coll., 9, 626 (1998); for reaction scheme, see Trimethylacetaldehyde, A15013. • The Li salt has been used as a catalyst for the Michael addition of dimethyl malonate to ɑ?-unsaturated aldehydes: J. Chem. Soc., Chem. Commun., 1088 (1991).